The LPG is a West Coast Synthesis staple! Our dual Low Pass Gate creates organic percussion timbres, paving the way for sonic exploration with a Buchla/Subotnick vibe. The LPG has two identical low pass gates in one module. Its unique non-linear qualities emulate percussion timbres like congas, bongos, plucks, etc. The LPG is vactrol based, which creates natural-sounding decays. When the CV input is pinged by short/fast envelopes, it results in more organic sounds like bongos. The slide pot functions in two ways: when the the CV input is not patched, it attenuates/mixes the audio signal. When the CV jack is patched, it attenuates the output level and changes the timbre of the audio signal. 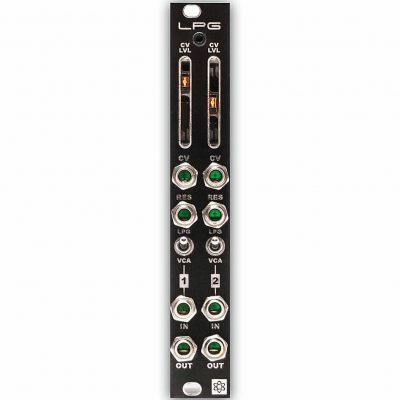 Each LPG channel can be used as a VCA. VCA mode bypasses the low pass filter and resonance and doesn’t color the sound of your input audio. The vactrol gives the VCA a living, breathing, non-linear response.